Loads more great new titles out today after the 2019 floodgates burst open last Friday! Plus a very special DJ set from the great Unloved TONIGHT! I'm not sure our New Release rack could handle another hit like last weeks bumper edition without finally bursting at the seams! Luckily this time round it's definitely quality over quantity, and we've been treated to some very special albums indeed. A big return from Beirut, a much anticipated vinyl pressing of Anderson.Paak's third album, a tribute to Arthur Russell from Peter Broderick & friends and a new compilation of Major Lazer's Essentials may catch your eye to begin with, but let's dive beneath the surface and see what other treasures we might find eh? You know the drill by now. 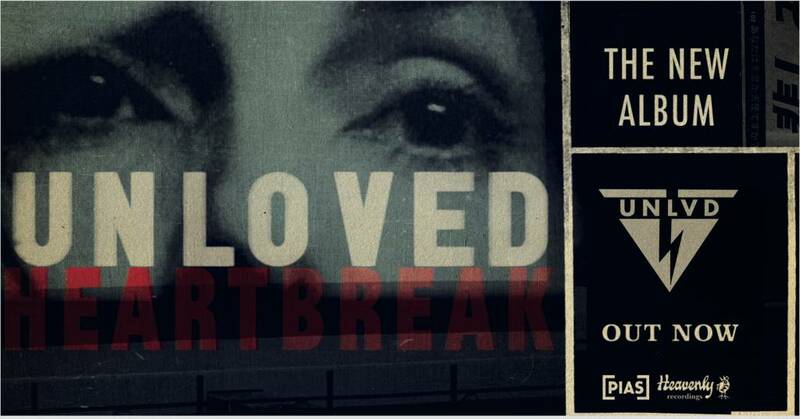 Gotta give a massive mention first of all to the gorgeous new Unloved album Heartbreak. David Holmes, Keefus Ciancia and Jade Vincent whip up something utterly classic and cinematic for album number two; nodding to 60s French Pop, girl groups and the big production sounds of Jack Nitzsche and George 'Shadow' Morton, Heartbreak is such a timeless sounding record that you may think you've heard it before. In actual fact, you may well have, thanks to much of the material being heavily utilised to transcendent effect in the hit BBC show Killing Eve. We're massive fans, and incredibly pleased to have them behind the counter (second time for Mr. Holmes) for a very special DJ set tonight from 8PM!! Big props to Third Man Records for properly capturing the rawness of Saharan Strat-shredder Mdou Moctar's live shows on Blue Stage Session. Can't get enough of this guy, the rhythms, the energy, ugh. Forget what ya heard about desert rock, this is the real deal. DJ Kicks is back, the first for 2019 being put together by Leon Vynehall. Some very interesting picks and changes of pace in here, such as a real rich drone from the queen of the long string instrument Ellen Fullman and that amazing funky track 'Rose & Beast' of Haruomi Hosono's Hosono House. Not to mention a couple of exclusive original productions from Vynehall himself! Another great addition to the DJ Kicks catalogue. Trunk Records bestow upon us yet another fantastic soundtrack release, this time it's the OST to Ken Loach's classic coming of age boy-meets-bird tale Kes, composed by John Cameron. A brief but heart wrenching listen, boasting a line-up of British jazz legends Harold McNair, Ronnie Ross, Tony Carr, Danny Moss, and David Snell. Oren Ambarchi's Black Truffle is another label that never dips below it's own high set bar, and today's reissue of Ruedi Häusermann's Galerie Randolph might even knock it up a notch! Truly unlike anything else.. opening with these bizarre bassy twanging strings, sounding like if the Clangers were enslaved for millions of years and had given up hope on life having a purpose,, maybe? The strings are then introduced to these intervaled wheezes of accordion, and they huddle together for the rest of the record while a terrifying world of clattering cymbals, garbled voices, distorted sax and discordant guitar forms and morphs around them. Poor guys. So there's my picks for this week, but as always pop in the shop for a browse and a hello, or view the full list of new releases on the website here!